Dubai International, the world’s number one hub for international passenger traffic, increased its capacity from 75 million to 90 million today with the opening of Concourse D, the result of a US$1.2 billion investment to enhance service and boost capacity for the more than 70 international airlines that will now call it home. The first flight to be welcomed at the facility was today’s British Airways’ flight 105. This historic first operation followed months of intensive testing and a successful operational trial involving 2,000 members of the public earlier this month. The trial volunteers played the role of passengers arriving at, departing from and transiting through Concourse D, testing way-finding signage, food and retail outlets and the flow of passenger traffic within the new building. Two airlines will operate from Concourse D on day one (British Airways, Royal Jordanian) with the remainder phasing in operations over the next several weeks. A number of world renowned brands will be introduced to Dubai and the region for the first time – including a casual dining concept The Kitchen which will offer passengers creations from the renowned celebrity chef Wolfgang Puck. Dubai Airports will also introduce the first Pret a Manger in a Middle Eastern airport. Other firsts for DXB include Butlers Chocolate Café and Camden Food Company which will bring healthy yet tasty dining options using organic and natural products. For those who enjoy a little theatre with their food, YO! Sushi will be a popular addition to the airport, while the CNN News Café will be a favourite for news junkies who want to stay connected to world affairs over coffee. Other new outlets include Lebanese favourite Sharwarmanji and Taqado Mexican Kitchen, both popular local examples of street food, in addition to a second Masale by Taste of India outlet but on a larger scale. Concourse D will also have established traveller favourites such as Giraffe – which will open its second outlet at Dubai International – Starbucks, KFC, Krispy Kreme, McDonald’s, Brioche Doree, The Noodle House, Caviar House & Prunier, Draft House sports bar, and Costa Coffee. The new concourse will offer plenty of comfortable seating spaces and wellbeing concepts such as Be Relax and the ever-popular ‘SnoozeCubes’ which provide a convenient way to rest between flights. 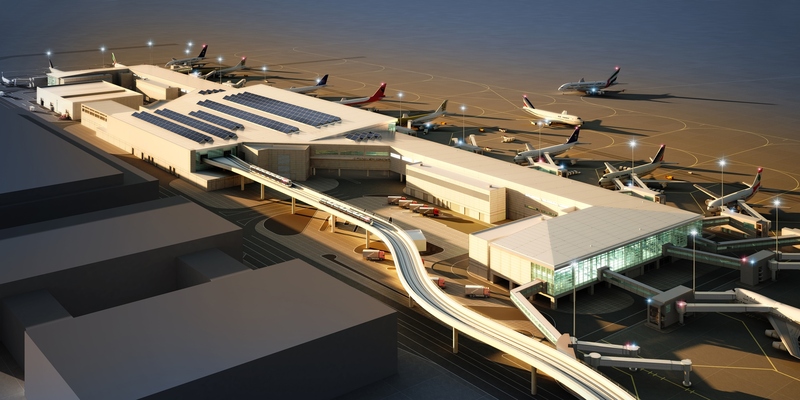 It will also feature a total of nine lounges spread over 6,926m2, including five airline lounges, a new Al Majlis lounge, two Dubai International Hotel lounges and a Marhaba VIP lounge. 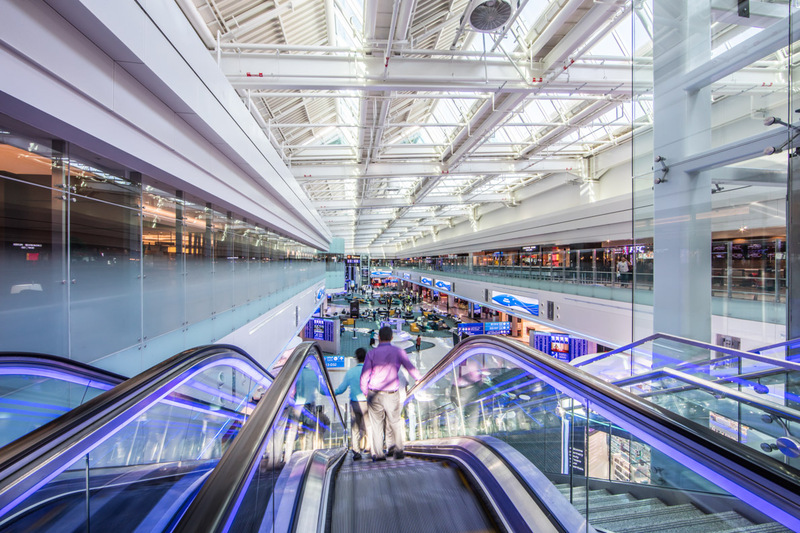 JC Decaux will exclusively operate Concourse D’s advertising concession, introducing Dubai International’s largest provision of digital and other advertising structures to date. In addition, the existing successful partnership with JTI will see the provision of three additional smoking lounges in Concourse D.
Dubai Duty Free has a total of 175 vendor installations in Concourse D spread over an area of 7,000m2, bringing the operation’s total retail space at DXB to 33,000m2. Fashion offer covers a total of 1,000m2 divided into two zones, perfumes and cosmetics cover a total area of 1,500m2 while liquor and food occupies nearly 1,000m2.